There’s no place like home! Honors Resident Advisors (RAs) are paid and trained housing employees and student leaders who want to give back to the honors community by creating a welcoming, comfortable, and supportive living environment for current honors students. They act as mentors, help students form study groups, advise students on how to get connected to Campuswide Honors and UCI, and inform students about UCI resources. RAs are also part of the honors leadership team, including the Campuswide Honors Student Council (CHSC) and Peer Academic Advisors (PAAs). Together, the honors leaders plan community events, coordinate honors volunteer activities, and address honors academic concerns. Honors freshmen, sophomores, and juniors in good standing are eligible to apply for this position. The RA position provides students with a wide array of transferable skills. 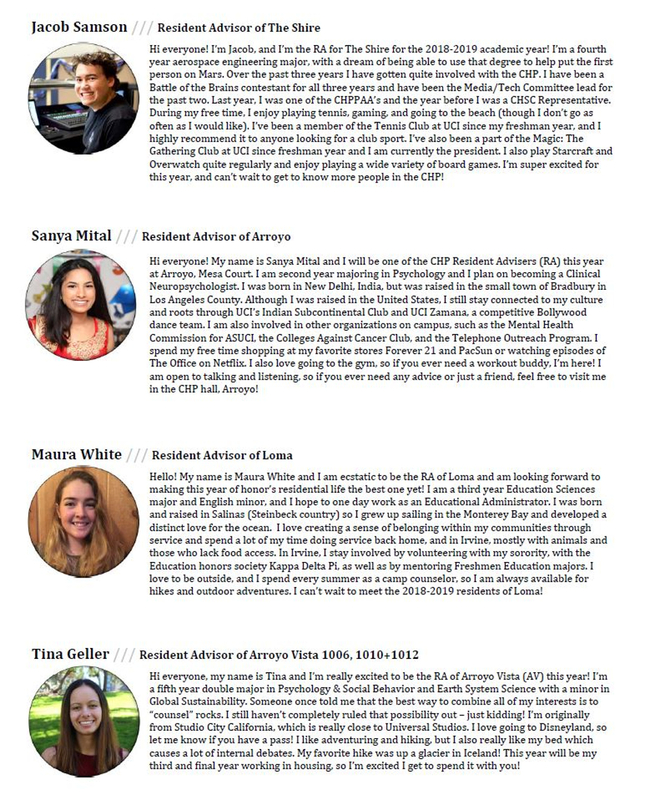 After graduating from UCI, Campuswide Honors RAs have gone on to be lawyers, professors, doctors, engineers, scientists, computer programmers, teachers, etc. Honors students who are looking for an immersive leadership and community experience would be a good fit for this position. For more information about the RA position as well as other leadership opportunities offered through housing, please see http://www.housing.uci.edu/communityLife/Leadership_and_Employment.html.